Every couple of weeks, I drive my mother-in-law to her afternoon card club in Port Wing, Wisconsin. While she plays 500, my dog Pip and I go birding. Right now I have brand new binoculars and my goal is to see a bunch of cool species through them, so I was especially happy for an opportunity to augment my new list, even though we’re always in Port Wing in early afternoon—the worst time of day for birding. August 24 was particularly lousy for finding birds as far as weather goes. The temperature never veered from 57 degrees, and the wind was fierce—20-30 miles per hour, gusting to 40. Belying the coldness of the water, Lake Superior was the color of espresso, churned up iron sediment making the water rich brown with foamy whitecaps. At the breakwater at the beach, giant waves splashed at least ten feet over the rocks, so the usual crowd of hundreds of Herring and Ring-billed Gulls and at least a few Caspian and Common Terns were gone. A few Herring Gulls flew overhead, but apparently the bulk of them were hiding out somewhere less exposed. Despite the poor conditions, I added 14 species to my binoculars list, including those Herring Gulls. Except for a big flock of starlings on a wire and a bunch of crows gathered on a recently mowed field, most of my birds were seen one by one. 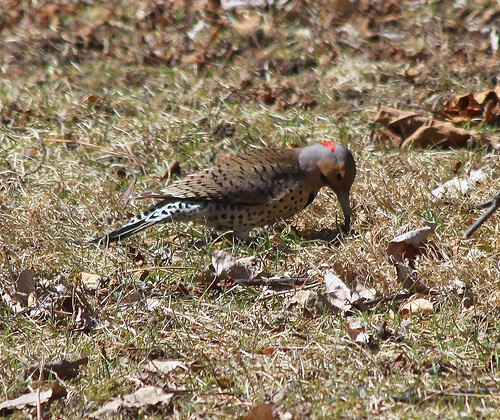 The one bird that I saw the most times throughout the day was the flicker. My first year of birding, 1975, Russ and I visited his parents in Port Wing for the last week of summer break, heading back to Lansing, Michigan on Labor Day. 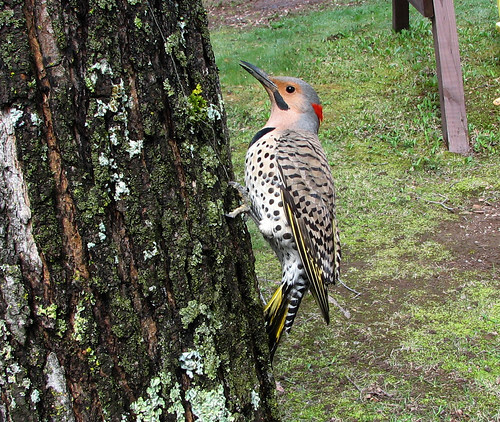 I got lots of lifers, breaking 100 on my life list, but one of the strongest memories I have of that week was of flickers—they were here, there, and everywhere. Some were perched on telephone poles, but most were flying up from every little dirt road, always from ahead before we got there, so always flying away, their large white rump patch exposed. 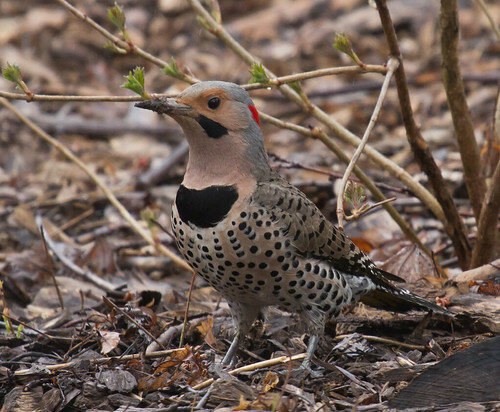 I’d seen flickers early on that spring, and many other times that summer, so I thought I really knew them, but that week in August was when I experienced them so very frequently that when one flew up, I stopped pulling up my binoculars and just watched. At first I confused their silhouette on the ground with that of robins, but that week is when I got that straight, too. The longer we bird, the more birds we truly know to the extent that just a tiny glimpse is all we need to recognize them. Of course, that happens with some species more quickly than others, and at first we don’t always realize that the birds we’re seeing a lot may not be the only ones with the features we’re starting to recognize. I was pretty sure I knew robins completely until that week. That's when I started paying closer attention to the shape to be sure the bird I was seeing was a robin rather than a flicker, but when I started being sure of that robin silhouette, I started noticing that Veeries and Swainson’s Thrushes also have that shape. They’re smaller, but the proportions are identical, so size isn’t useful. Once I figured that out, I started paying attention to other features that made it clear which thrush was which even in awful light when colors weren’t visible through my inexpensive binoculars. Even after I could be certain of robins on the ground, for a couple of years, robins flying overhead blended in with all the other unidentifiable flying objects. I had to start paying attention to specific features: their distinctive flight call, the way they whip their wings back, and the spot of white from the lower belly to the tail, visible even when no colors can be discerned, before I grew confident of them in flight. By then I could also pick out Blue Jays in flight, by their rounded wings that beat steadily up and down, their straight flight, and the white on their tails. 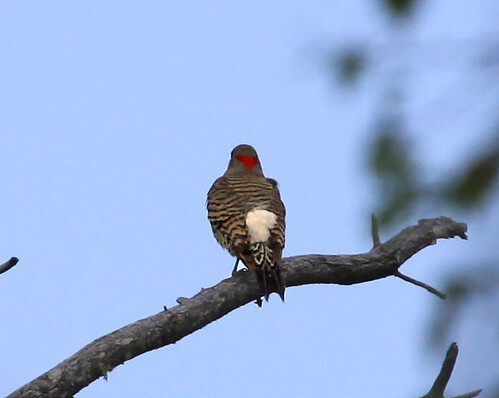 Flickers were SO easy because of their swoopy flight, the yellow under the wings and tail, and of course that white rump, as identifiable as a flag in battle. There’s a comfort and quiet joy in recognizing our favorite familiar birds no matter what they’re doing. There is so much anger and random violence in the world right now, but somehow, watching flickers flying up from the same dirt roads they’re always flying up from in late August, I had a lovely feeling that the world is exactly as it should be. Of course, it isn’t, at least not for us human beings, but as long as flickers fly up from roadsides in late August, we can be assured that despite everything else, a tiny bit of sanity and normalcy remain here on this little planet we call home.